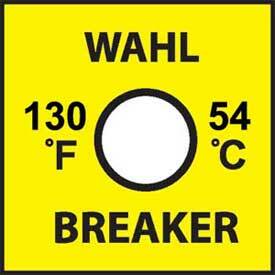 Instant Temperature Record: Wahl Breakers are self adhesive temperature recording labels that can be read at a glance. Rated temperature is printed at the sensor window. Each Wahl Breaker contains one sealed heat-sensitive element which changes chemical structure when exposed to heat exceeding their calibrated temperatures. Each pearl gray indicator turns permanently and irreversibly black in less than one second and with ± 1% accuracy. Wahl Breakers miniaturized size permits installation on parts and in areas where other recording instruments prove impractical. Wahl Breakers provide a continuous monitor for overheat that does not distort the temperature of the item being measured. Wahl Breakers are easy to apply. 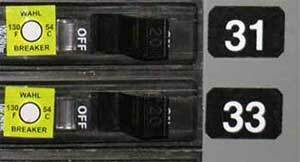 Construction: Wahl Breakers use a laminated construction consisting of a heat resistant mylar cover to encapsulate the temperature-sensitive chemical indicators and protect them from contamination from water, oil and solvents. The bottom laminate of plastic film contains pressure sensitive adhesive rated for elevated temperature installation. To install, remove the protective backing and apply to any clean, dry surface. Quality Assurance: Wahl Breakers are manufactured with the same meticulous care as all other Wahl Instruments. Temperature accuracy is verified by calibration tests on all lots of chemical elements used in the manufactured of Wahl Breakers. Records of the calibration data are on permanent file at Wahl by lot number, where the accuracy of test instrumentation is traceable to the U.S. National Institute of Standards and Technology.